292 pages | 7 Color Illus. | 72 B/W Illus. Nanocomposites have better adsorption capacity, selectivity, and stability than nanoparticles. Therefore, they find diversified applications in many areas. Recently, various methods for heavy metal detection from water have been extensively studied. The adsorption of various pollutants such as heavy metal ions and dyes from the contaminated water with the help of nanocomposites has attracted significant attention. This book presents a comprehensive discussion on wastewater research. It covers a vast background of the recent literature. It describes the applications of nanocomposites in various areas, including environmental science. Particularly, it is highly useful to researchers involved in the environmental and water research on nanocomposites and their applications. The book covers a broad research area of chemistry, physics, materials science, polymer science and engineering, and nanotechnology to present an interdisciplinary approach and also throws light on the recent advances in the field. "This unique book focuses on the role of nanoparticles and biopolymer-based nanocomposites in wastewater treatment. The chapters are authored by prominent researchers across the world. The book will be useful for undergraduate and postgraduate students, scientists, academicians, research scholars, material engineers, and industries in this field." "The book Nanocomposites in Wastewater Treatment is a credible and well-written book on this important topic. The discussion and conclusions associated with each chapter are appropriate and are written very clearly. This book is apparently novel and should be useful in this area for practitioners and educators. 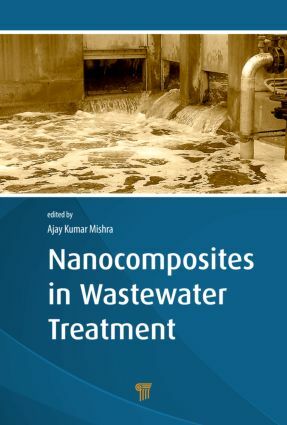 The book meets the stated objectives and describes the application of different nanocomposites in wastewater treatment, covering a broader research area of chemistry, physics, materials science, polymer science, engineering, and nanotechnology. Readers can gain knowledge about the preparation of nanocomposites, characterization techniques, and the role of the nanocomposites for applications such as water treatment, remediation, speciation, water research, medicine, and sensors. They can gain fundamental knowledge of recent advancements, approaches, and prospects in research and development of nanocomposites. Readers will also learn about the problems associated with wastewater, different treatment methods, and water treatment technology. This book is geared toward undergraduate and graduate (master’s and PhD) students and researchers, educators, or scholars working in the areas of water treatment, environmental sciences, and nanomaterials. Materials scientists and industry should also find it useful." A View on Cellulosic Nano-Composites for Treatment of Waste Water Saravana Bavan D. and Mohan Kumar G. C.
Ajay Kumar Mishra is associate professor in the Department of Applied Chemistry, University of Johannesburg, South Africa, and adjunct professor at Jiangsu University, China. He has a PhD in chemistry from the Department of Chemistry, University of Delhi, India. He leads a research group in nanocomposites, water research, and bio-inorganic chemistry. He has collaborated with researchers, scientists, and postdocs in his group and worldwide. Prof. Mishra has published numerous articles in international journals, edited several books, and delivered many plenary, keynote, and invited lectures. For his outstanding research, he has been bestowed with a number of awards. Prof. Mishra has served as an associate editor as well as a member of the editorial boards of many international journals, besides being a member of several scientific societies.